Amos Beech have supplied us with office furniture and assisted with office moves and fit-out requirements in our previous premises for over 10 years. When our lease expired on the premises, we engaged with them and others on a competitive basis to select a supplier who could look after the entire process of an office design, build and move that also included an R&D Design lab requirement too. Amos Beech consistently delivered in terms of gaining an understanding of the way we work and how to deliver a built environment that accurately reflected our needs. By engaging with our various heads of departments and the senior management team they were able to create both excitement and confidence that their vision for us was what we wanted and needed. The competitive process ran its course and Amos Beech were duly appointed. Due to a protracted procurement process, the build program was truncated as our exit from our existing premises was not going to change. It is fair to say that the team at Amos Beech rose to the challenge and delivered on their promises. Amos Beech provided both the interior fit-out and all furniture items and handled a complex move of our testing/lab equipment as well as all our office IT and personal effects from the old offices to the new. We are now extremely proud owners of a wonderful facility that includes so many different types of space which staff are both using and giving highly positive feedback on. The labs, dark rooms and specialist equipment rooms more than meet our requirements and their design is such that as our needs change we will be able to make adjustments to them as necessary. Visitors to the new office are more than impressed as we are now able to visibly demonstrate our global standing in the microelectronics industry to our customers and helping to attract top talent to join our team. A close working relationship with high levels of trust is crucial to the success of a project like this and we have no hesitation in recommending the team at Amos Beech to potential clients for their integrity, commitment and professional abilities. I am happy to provide a reference in respect of the work of Amos Beech. The refurbishment of our office was planned to precision and the quality of the product and the workmanship is first class. Beyond that I have always expressed my gratitude to you and your family for an excellent service and I have recommended the company on many occasions because of its ethos. Amos Beech were initially approached by Teleperformance in August 2013 to carry out occupancy studies for a potential new call centre in the centre of Glasgow. They carried out a full site survey and prepared plans showing us how we could accommodate up to 600 staff over 3 floors of office space. This also included discussions with building control around issues such as occupancy levels, fire escape routes, air conditioning upgrades data and electrical design and on site emergency generator provision. The project was given sign off in April 2015 and Amos Beech were given the role of Main Contractor to deliver the entire works package and furniture so that we could take occupancy in August/September 2015. Working to a very tight timeline, Roy James headed up the project team and provided fortnightly site update meetings both on site and via teleconference. The Amos Beech team provided a full time Site Manager who inducted all contractors and maintained a 100% heath and safety record. Amos Beech were also responsible for planning, liaising and working with our M&E contractors to ensure the project plan ran smoothly and on time. The building we occupy has other tenants and at all times Amos Beech were exemplary in their respect for both the building and our neighbours. The project was handed over to us on the date requested and on budget. Whilst there was some snagging, this was dealt with promptly by Roy and his team and we have now been in our new call centre for 12 months and would be very happy to recommend Amos Beech tom other companies looking for similar services. The HB Task Chair, which you have delivered and configured to my height, weight and posture has made an immediate difference in a number of ways. The arm rest heights are just right. The dynamic tilt movement adapts to my sitting position, which makes both my legs and my lower back feel much more comfortable. In the previous standard office chair, I could not sit for long (1 hour maximum) before feeling very restless and uncomfortable. Whereas now, I can sit without getting distracted and needing to constantly shift around. What a difference to my posture, my lower back pain and my concentration level! From the outset we built up an excellent working relationship with the Amos Beech team, they took total ownership of delivering the project having made sure that we were 100% satisfied with their plan before works commenced. Amos Beech are professional, pragmatic and dedicated to achieving the highest standards. Amos Beech delivered a complete turnkey fit out solution from conception and design, all associated construction works, access control, furniture and fittings etc. I was always able to rely on their flexibility and courteous service, everyone in their team were a delight to work with, where nothing was considered an issue, I have no hesitation in recommending your company to others. Our installation was completed in the two days as promised, in a manner both pleasant & professional. The few, very minor, glitches have been handled with willingness & expediency. The quality of the furniture exceeds our expectations and the layout and design have proved to be very good. Thank you again for your professionalism. I would have no hesitation in recommending Amos Beech for quality products, completing within a short time scale, and in particular for putting the needs of the client at the centre of the service offered, the result being a building that has instant impact and an ambiance based on merging modern design with comfort and an eye for detail. 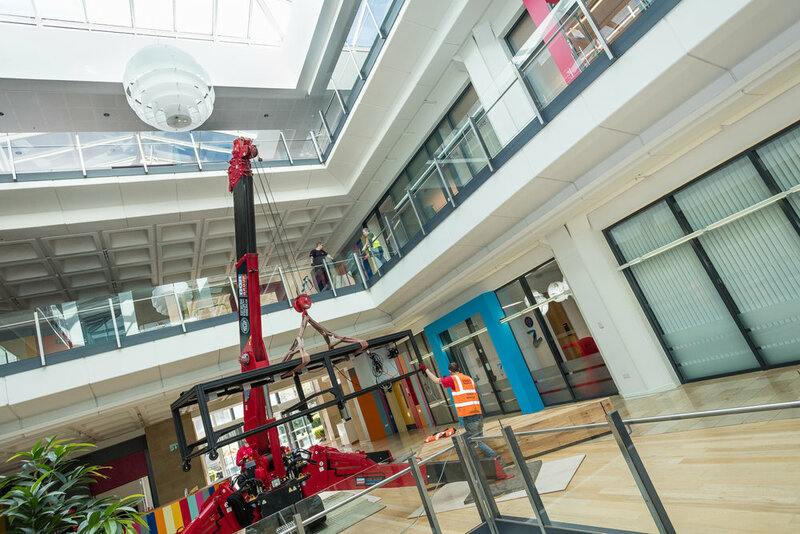 Amos Beech won a £1m contract for our new Lister building to supply and fit 550 work stations including executive areas, board and meeting rooms, canteen, breakout areas, bespoke reception & client areas. We can highly recommend Amos Beech for the quality of their products and their highly professional, personal and efficient service. I had been suffering from back-related pains for the best part of two months. I have now been using a BMA chair for a month and I am delighted to say that these disappeared almost immediately and have not recurred. Thank you for your assistance and the service your company provided, which was excellent. When we took the decision to move to new offices in 2014, our next big decision was choosing the right Interior Fit-out Company to help us on our journey. Amos Beech delivered an on-budget and in-time project completion and we have no hesitation in recommending them to their potential clients. The commercial offices of the Russell & Spalding brands in Europe were seeking to relocate and approached Amos Beech based on a recommendation. We found Amos Beech, especially Roy James, to be a great partner with our office move and would not hesitate to recommend them. Amos Beech supplied and fitting all fixtures and storage within our 3 story office. The service provided by them was first class, the project was completed in time, and within budget, and to a very high standard. The quality of the fit out is excellent and has really allowed us to subtly brand our offices and make them truly fit for purpose. We awarded our project to Amos Beech in 2011 and gave them a 10 week deadline to complete the total refurbishment of our new offices. Everything was completed on time and in budget. This is testament to the excellent project management skills at Amos Beech and we would not hesitate to recommend them to other business in the Oil & Gas industry.